I read about these cute little units on a Craftsy blog entry from September 2013, although the link I came through was from a list of links. I assume the name HexDen comes from the combination of Hexagon and Dresden plate templates. My current Forever Project (™) happens to be ginormous hexagon flowers which will be put together into a double-size top (I think .. I kinda forget the final size), so when I saw this unit, I was captivated! 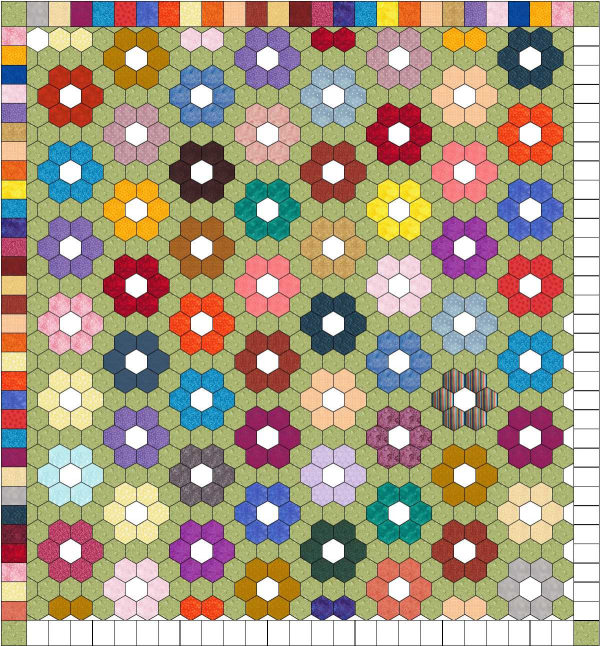 It occurred to me that it wouldn't be very practical to use the HexDen flower units in the same way one uses the Grandmother Flower Garden block because of the curved edges ... BUT .. they would be absolutely AWESOME as appliqued flowers! 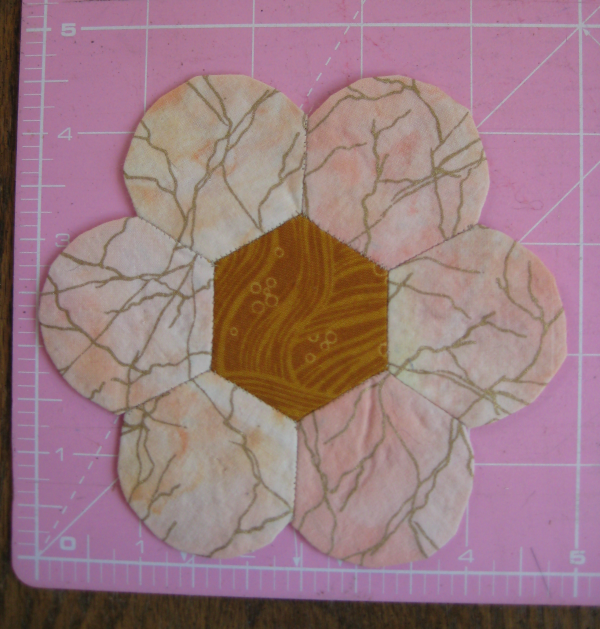 For this unit, I used a 1" hexagon template. As you can see by the ruler measurements at the side and bottom, this flower unit is *about* 5" square. Kinda/sorta. More or less. It is cuter than a bug's ear! 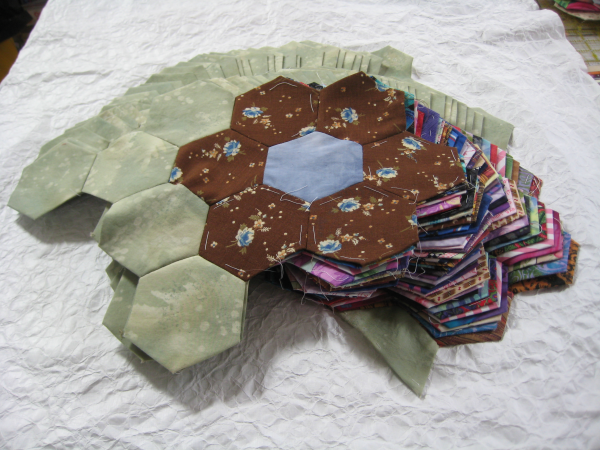 I must say, though, it did take me a bit longer to make each hexagon/Dresden Plate unit than the hexagon-only unit. 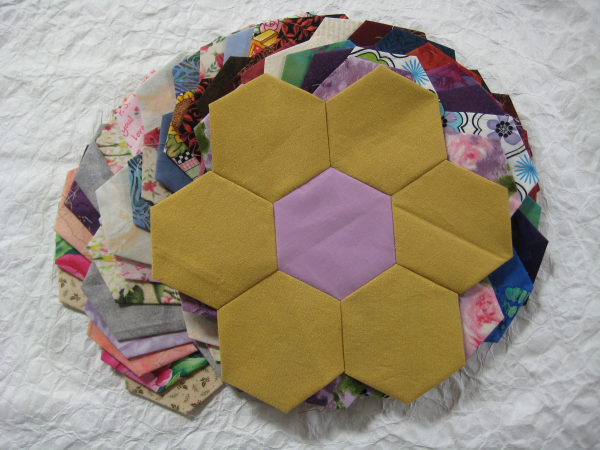 For the hexagon-only unit, you simply flip the fabric over the sides of the template and quickly put in some basting stitches to hold the folded corners in place. But the petal units are a bit trickier ... to have that curved edge nice and smooth, you hand-stitch a row of gathering stitches so you can pull them up. It takes more time to put in those gathering stitches as you stitch down the folded corners. I also discovered, at least for me, that you really need to *press* each hexagon & petal unit after you've basted it. 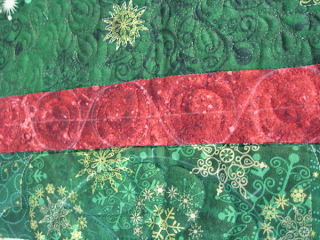 That pressed edge is critical when it comes time to stitch each unit to each other. When I did the first petal unit, I pulled out the template before pressing and .. ooopppsss ... the curved edge really didn't stay in place. But once I did press it firmly, the folded curved edge behaved nicely. 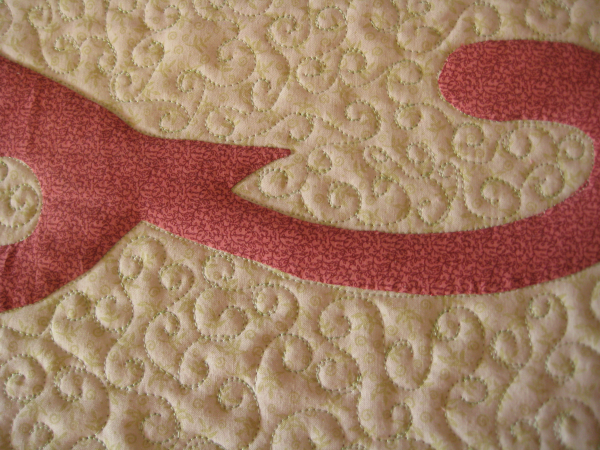 AND THEN ... the quilting gods must have been smiling upon me because in Piece N Quilt's blog (by Natalia Whiting Bonner and Kathleen Jasperson Whiting) that I read yesterday, they showed a quilt with alternating columns of Flying Geese and a wavy vine with appliqued flowers. Can't you just SEE using the HexDen flowers instead of the country flowers? So, now that I've made my little sample HexDen flower, I can tuck it away with my instructions, templates and inspirational photo so that when I get back to it (whenever that may be), I will know exactly what I had been thinking. In my blog reading, I came across a layout that looked really interesting: "Picture Frames", a freely downloadable PDF from Little Miss Shabby blog. I made my version slightly larger than the PDF describes, by adding a additional rows & columns. Remember that little fact because it came back to bite me. I like the graphic aspect of this layout. It's designed for layer cake pre-cuts but honestly, you could use any size square you wanted; you'd just need to adjust the framing strips. As I went through my flannel stash, I realized that with the leftover remnants that I wanted to use, I wouldn't be able to get an 8" square, which is the focus fabric. *I* could only get a 5" square ... so I downsized the block but increased the number of rows and columns. I also realized that if I used flannel for the whole thing, that would result in just a whole lotta seams and intersections, which would make the resultant top not only heavy but *bulky*. Not what I wanted as a final product. 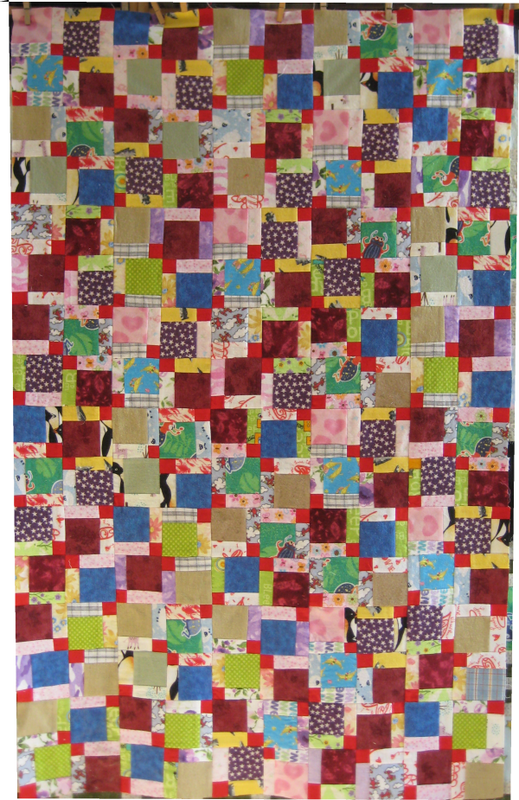 So, I opted to use the flannel *only* as the focus 5" square and quilting cotton as the framing strips. I'm merrily cutting my squares and strips; sewing them all together; assembling the blocks into rows and sewing the rows together. It's looking pretty good. But wait. What's this? The green Moda Marbles I'm using for one of the framing strips looks to be running a bit short. Well, remember that my squares were smaller than the PDF required so I needed to make more of them? Just bite me cuz I ran out of the green. ::head thunk:: Fortunately, it *is* a Moda Marble but as my particular stash chunk is ::ahem:: "vintage", I knew there would be no chance of getting the same dye lot. The best I could hope for was to get an olive green in the same general color family. I was able to find an olive green Marbles online but ya know .. you just can't color match on monitors. But .. ::shrug:: it really didn't matter, since I didn't have a choice. I ordered an additional yard of the olive green; it will arrive here "soon". In order to make this faux pas slightly more palatable,the new, additional olive green (whatever shade it turns out to be) will be in the middle rows .. so it (hopefully) looks kinda/sorta planned. eh .. whatever. Eventually, the additional Moda Marbles arrived and .... ::sigh:: my original green apparently is NOT "olive" green but some other shade. The olive green that arrived is slightly lighter than what is already in the quilt. Well ... it is what it is. This top is approximately 64" x 64". I mentioned previously that I had "rediscovered" my flannel stash. Fondling flannel is so sensuous. :-) I was tempted ... and I succumbed ... to making "something" with the flannel, even though I have pre-assembled projects to work on. In any case, here are the three flannel tops that I've actually finished in January (and here it is, only January 19th!). The original fund-raiser toddler top, done in all solids. I distinctly and specifically chose this layout because of the *minimum* of seams and intersections. I figured that using flannel would make everything overly bulky and heavy, so a simply layout would be best. BUT THEN .... I think the Pod People took over my brain for the next top. I had a bunch of 3" strips leftover from the above top. I wanted to use them up. So, did I chose another layout that also had a minimum of seams and intersections? Heck no. I chose Disappearing 9-Patch. HOLY MOLEY. Could I have chose anything more MORE seams and intersections? Possibly .. but thankfully I did not! The only consistent aspect of the 9-patches was that I used red flannel for the center square (the one that gets sliced into four pieces). Other than that, I tried to make the rest of the 9-patch totally random. I did have more of some colors than others, so they show up more in the finished top. The last top I've finished comes from a free pattern "A Little Folk Tale", which is the name of the fabric line used not because the layout is reminiscent of folk tales. What attracted me was the simple graphic-ness of the layout. 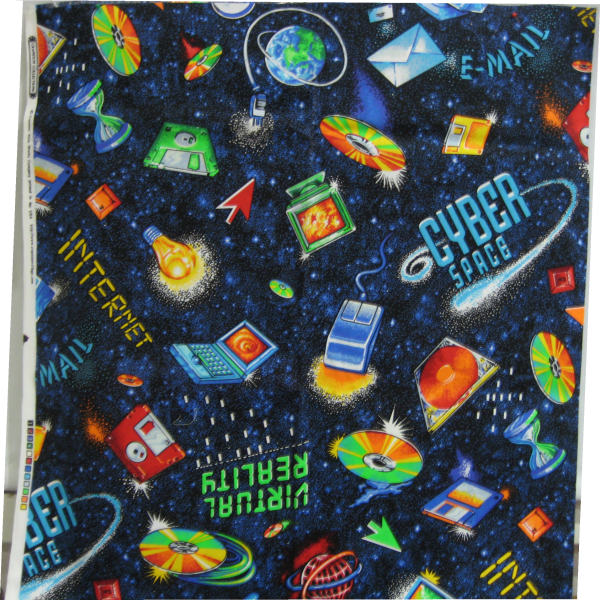 It is also a very good way to showcase any nifty fabrics that you do have. Because I was still working with the 3" strips I had previously cut, my finished top is slightly smaller than what the pattern calls for. But at 51" x 63", I think it's still a good, useable size. Last November, my son-in-law's mother asked me to make a toddler-sized fundraiser quilt for the daycare/preschool that she is associated it. For this one, I wanted something that was easy to construct and not too fancy or intricate. All of you know that fundraiser items just never get the amount they deserve. Especially anything handmade. The audience, bless their souls for being at the fundraiser, typically isn't too discerning regarding handmades. So, I didn't want to put a whole *lot* of effort into this; no intricate piecing, no applique (specifically, no *hand* applique), no custom quilting. I went through my library of inspirational photos I've been collecting over the years and decided on a simple 4-patch surrounded by a wide frame. The blocks are 10" and with a layout of 4x5 blocks, the finished size will be about 40" x 50". I had recently "rediscovered" my flannel stash and was inspired to use the remnants buried in it for this quilt. 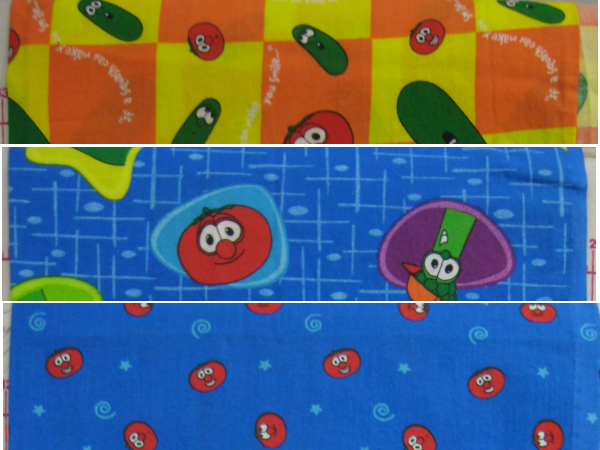 One thing about flannels, you need to minimize the number of seams and intersections because sometimes you just can NOT get those intersections *flat* and when you increase the number of seams, you're also increasing the weight of the quilt. Additionally, since we *are* in the San Francisco Bay Area of California, winters just aren't really COLD, ya know? So, we typically don't need really warm quilts. To keep my "costs" down, I have opted to not use batting at all. Instead, I am going to use fleece as batting/backing. I've done this in other quilts and the result is wonderful. 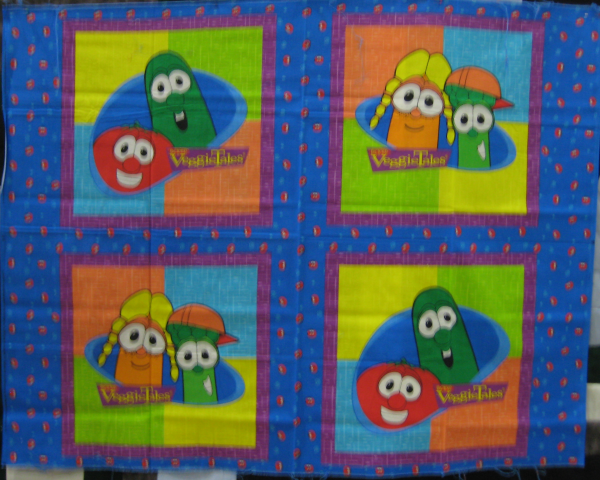 The quilt is soft, warm, drapeable and washable ... all requirements necessary for a toddler quilt. 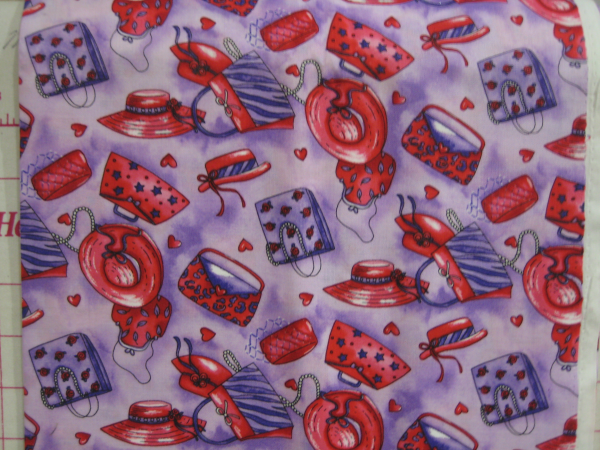 This is a photo of the finished top. 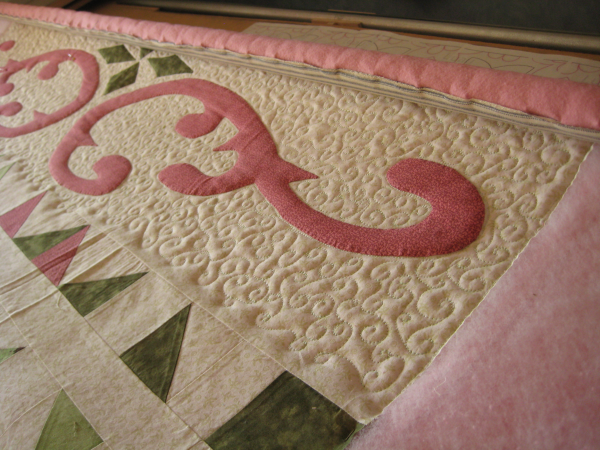 I do need to complete the quilting on the quilt that's currently loaded on Lizzie before I can do this one ... so that gives me incentive to return to the quilting. If I remember correctly, the fundraiser is sometime in March. 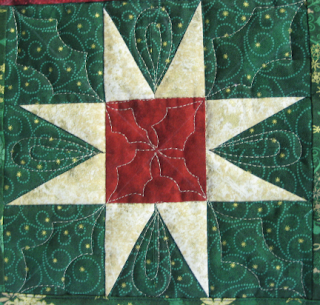 I plan on using an all-over quilting design. 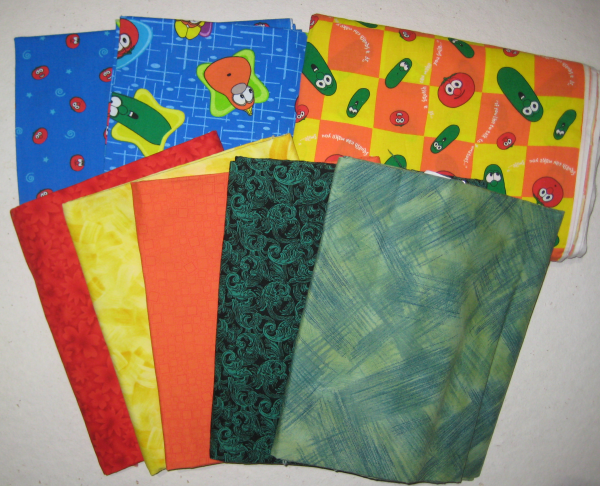 I have a whole messload of unquilted tops. I made a list of them a long time ago. 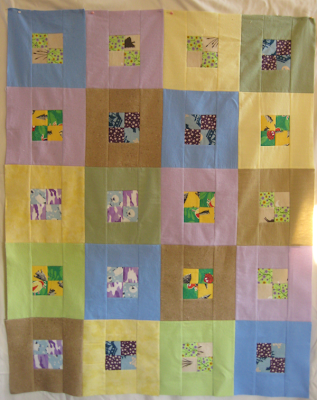 I've steadily worked on quilting them and the satisfaction of doing so was lovely. I plucked all of the low-hanging fruit, as it were, and what's now left is tops that are of fairly large dimensions, which means that it's going to take more than "a while" to get them quilted. 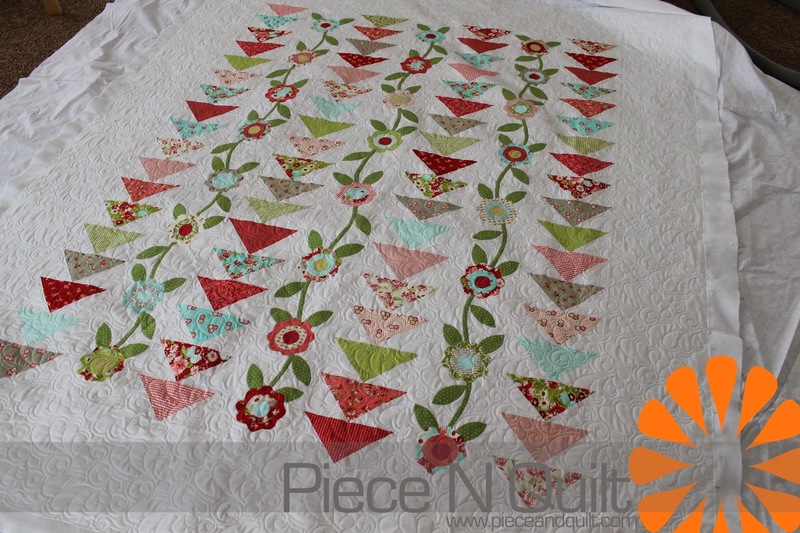 I put the appliqued bands at the top and bottom to make the quilt a more useable dimension, so this top is a combination of pieced Carpenter Wheels and applique. And therein lies the problem for me. How do I quilt this thing? I was thinking I'd like to do something on the background that would tie the applique and pieced parts together but do something different for the pieced segments. 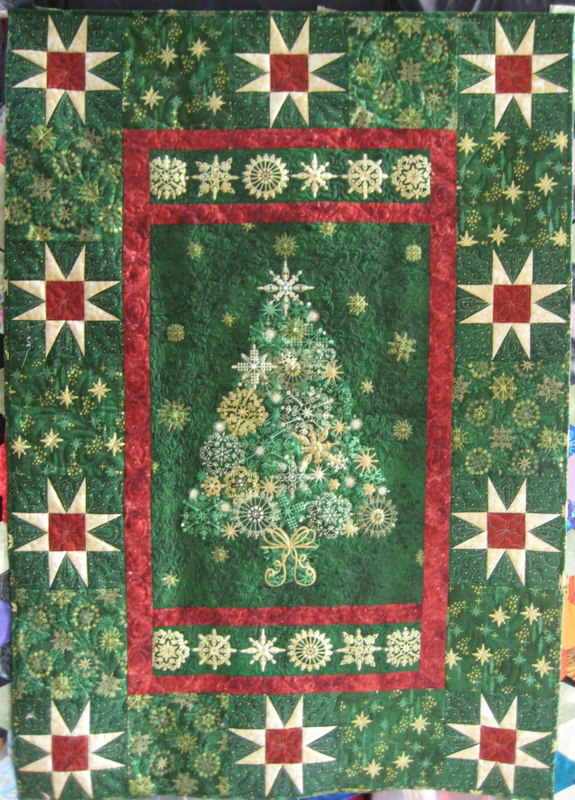 I didn't want do to the clamshell/peacock feathers again; I had done that on a couple of previous quilts. 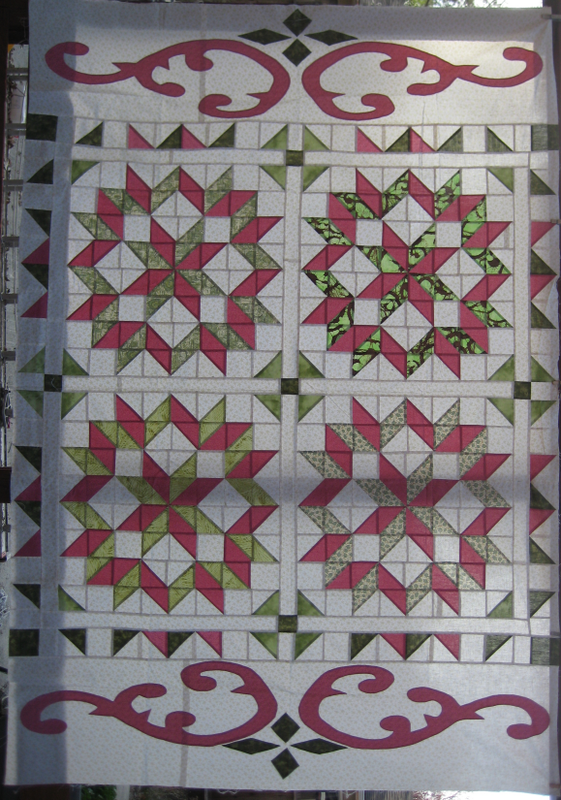 Aside: is there some unwritten rule that says quilters shouldn't use the same designs repeatedly? That we ought to use NEW! FRESH! designs each time? This just taxes my poor one brain cell too much. On the other hand, I can see myself falling back on using the "same old designs" again and again because they are familiar. 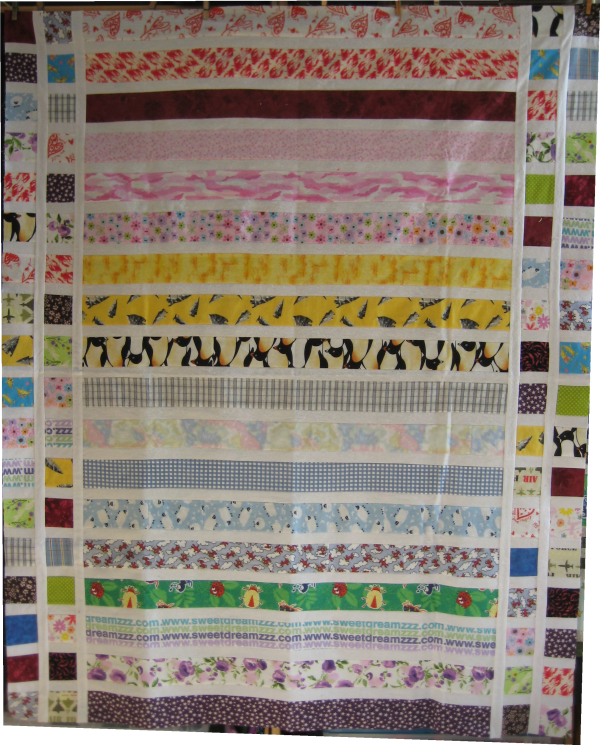 And that would make the quilts look rather boring, don't you think? Anyway ... 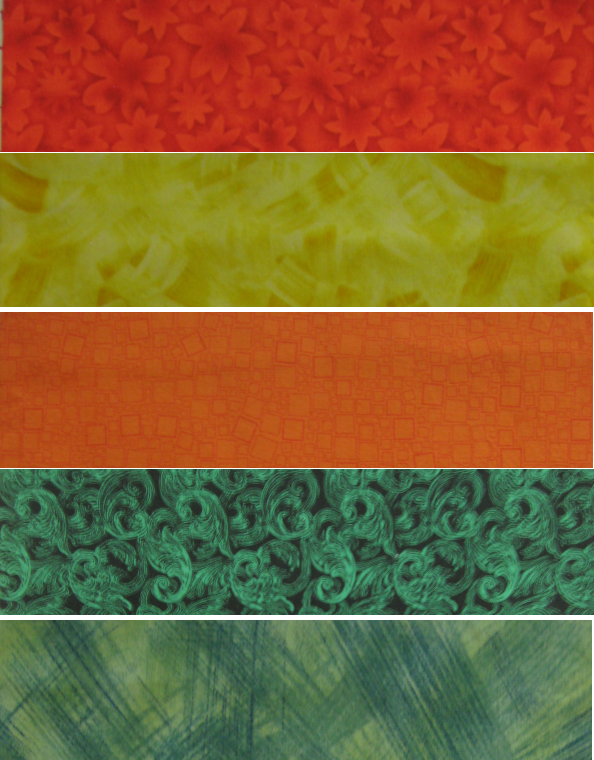 I finally decided on a random, branching scrolly design for the off-white background fabric. I chose a light green Glide thread (I *love* this thread!) and Superior's Bottom Line for the bobbin. 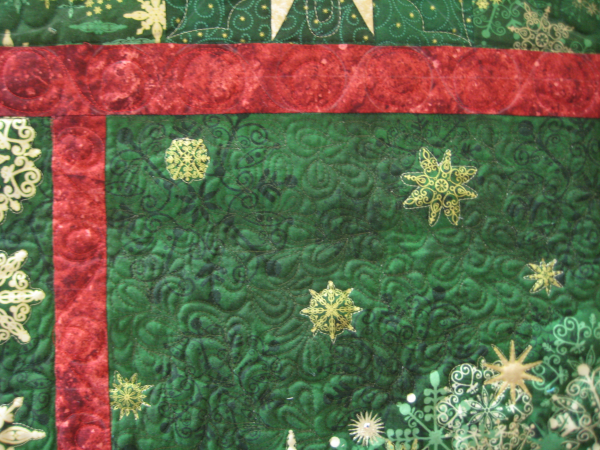 I've outlined the applique pieces so they will puff up; I like that effect. These pictures are where I currently am. I've just completed the scrolly background quilting in the available area and the quilt was advanced slightly so I could take pictures. 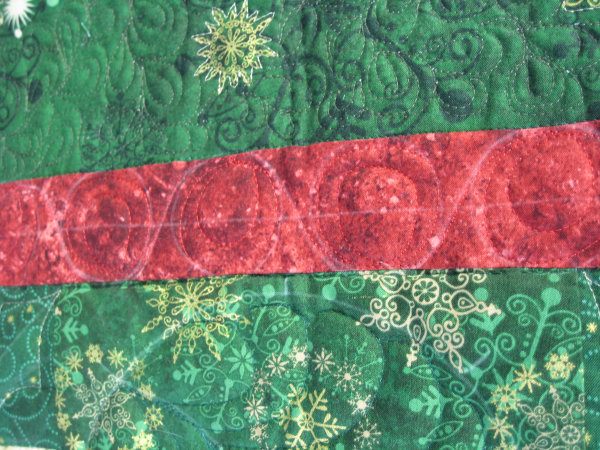 Hopefully, when I get back quilting, I'll be able to hook the scrolls from the next areas unobtrusively into the previously quilted areas, so it won't look like "OH! See where she had to advance the quilt?". As for the pieced segments ... I know I had an idea of what to do with them before I started quilting. I know from past experience that *I* really need an overall plan before I even load the quilt. If I don't, the quilting suffers. 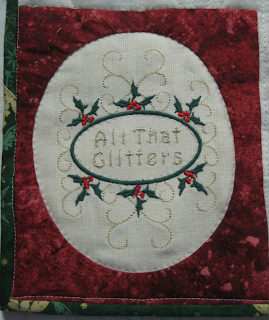 All That Glitters - finished! Our youngest daughter, DD#3, loves everything Christmas. I'm sure she would start listening to Christmas carols in July except for people around would her would probably thwap her over the head for starting too early. What I loved about this project was the layout. Prior to buying it, I had not realized this was a panel print (the Christmas tree and snowflakes immediately above/below it). 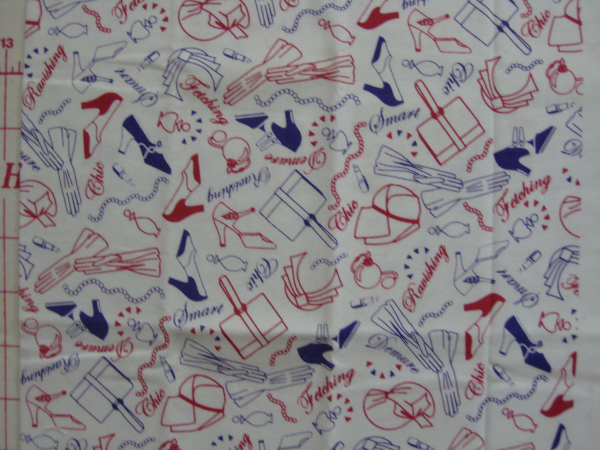 But later Googling for quilting ideas showed me that MOST people who used the panel print did not have this specific pattern and simply used the panel print as-is. 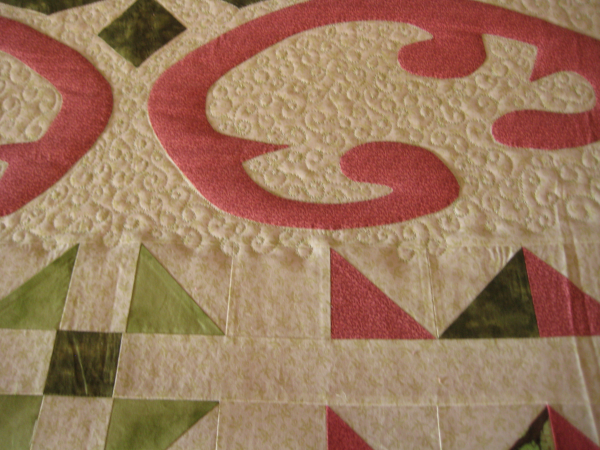 As for the quilting. Oy vey .. my downfall every single time. Sometimes a brainstorm will hit me and some times I just sit and stare for days. To be sure, I have a lot of reference books for inspiration, as well as Googling the internet. Sometimes, there is just TOO MUCH inspiration and I become overwhelmed. But, eventually, I settled down and devised a plan. Mostly, I used Glide "Khaki" thread - this is totally a misnomer. It really looks like a burnished old gold. It is absolutely luscious stuff. My Tin Lizzie has never had a problem with this thread (knock on wood). Where I didn't want the quilting to overly show, I used Superior's So Fine in a matching color. The backing is muslin and the thread used in the bobbin is Superior's Bottom Line. color with a clamshell/peacock feather design. That flattens the background and allows the other areas to "puff up". 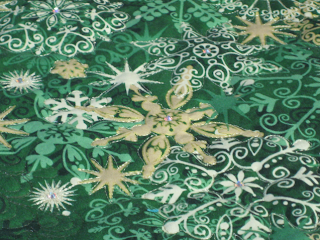 For the tree itself, I used the Glide thread and outlined the major snowflakes. I did the same outlining in the snowflake strip above & below the tree. 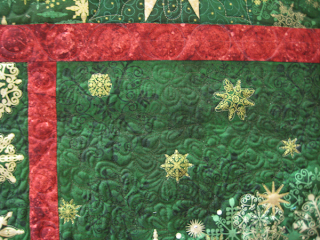 There are some small snowflakes in the background and they were outlined in gold also. 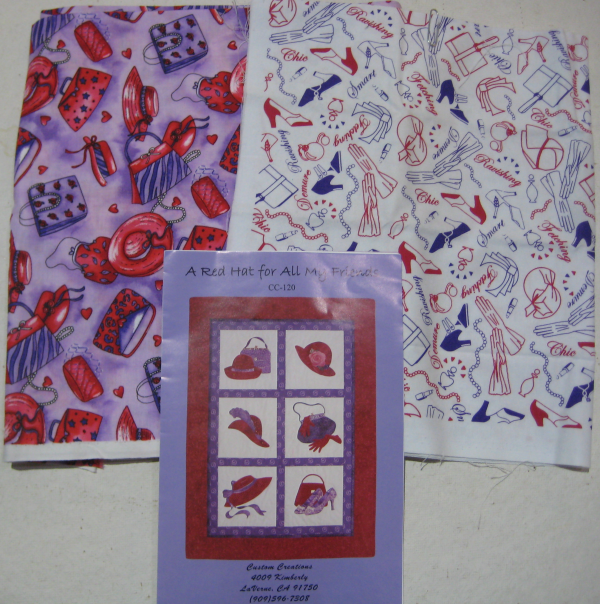 The red sashings got a really nice undulating, circle-in-a-circle design in matching red thread. You can still see the chalk marks I made, as guidance, in the sashing. 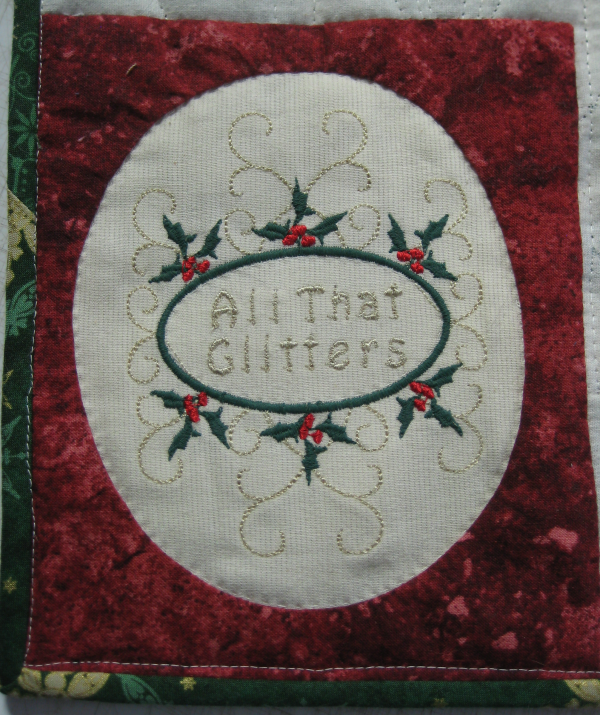 As for labels, I have a standard "pirate" label that I use only for family quilts (and maybe on some gift quilts) ... it never goes on donated quilts but I also machine embroidered a label with the quilt's name, "All That Glitters". The machine embroidery design came from Ginger's "Gone Sewing" and stitched out absolutely beautiful. I love her designs. Unfortunately, it seems that Ginger has problems in keeping her website available, as it has been in existence under several different domain names. At this time, I can't find this design, so I can't link to it for you. The verbiage doesn't come with the design; you add what you want. As the final pièce de résistance, there is bling on the wall-hanging! Originally, mini-LED Christmas lights were to be inserted through buttonholes in the snowflakes, so that you could light up the tree. 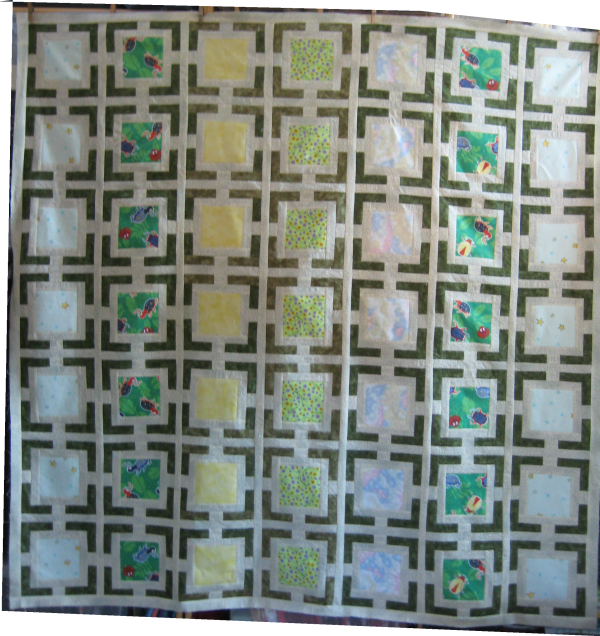 But other quilters who finished this panel before I did, complained that the wires and battery pack on the back of the wall-hanging made it very bulky and unable to lie flat against the wall. The universal consensus was that, while the lights were conceptually a great idea, practically speaking, it was a disaster. Instead, I put Swarovski crystals in the center of the snowflakes. They twinkle when sunlight hits them and look so pretty! :-) This was the first time I have used hot fix crystals and was pleasantly surprised how easy it was (although you do need the special hot fix applicator).